Researchers at The University of Toledo are examining how a genetic kidney disorder also increases the person’s risk of cardiovascular disease and stroke. Dr. Wissam AbouAlaiwi, assistant professor in the Department of Pharmacology and Experimental Therapeutics, received a three-year, $231,000 Scientist Development Grant, and doctoral student Hannah Saternos received a $2,000 award from the American Heart Association to study the pathophysiology of cardiovascular disease in polycystic kidney disease (PKD). 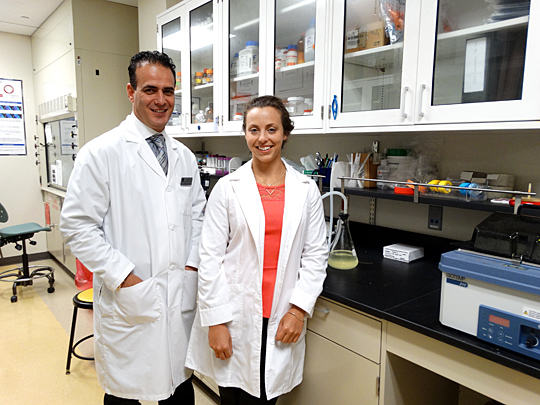 Dr. Wissam AbouAlaiwi and doctoral student Hannah Saternos both received grants for their research examining how a genetic kidney disorder increases a person’s risk of cardiovascular disease and stroke. PKD is a genetic disorder that causes numerous fluid-filled cysts to grow in the kidneys, ultimately destroying their architecture and reducing their function over time. These cysts also are associated with the development of high blood pressure and problems with the heart and blood vessels in the brain. “There is currently no cure or treatment for PKD. A kidney transplant can buy an individual more time, but patients with PKD will still usually die from cardiovascular complications such as high blood pressure and heart disease,” AbouAlaiwi said. AbouAlaiwi and his team are studying a cellular organelle called primary cilia and its role in kidney and cardiovascular disease. This is the third grant for AbouAlaiwi’s lab in one year, and he is quick to credit his team of students for their hard work and dedication. Saternos is researching the function of a family of receptors that she recently discovered in the primary cilia and how it affects PKD and regulates blood pressure. This entry was posted on Monday, September 12th, 2016 at 3:55 am and is filed under News, Pharmacy and Pharmaceutical Sciences, Research, UToday .